The Get Started articles assume that you've completed running the Trumba® Startup Wizard. When you've completed the wizard, the Trumba editing environment opens to your new calendar, which shows as active (and selected with a check mark) under Current Publication on the left and highlighted in the screenshot below. If you have any questions about this, please email Trumba Sales or call 1-800-925-0388. 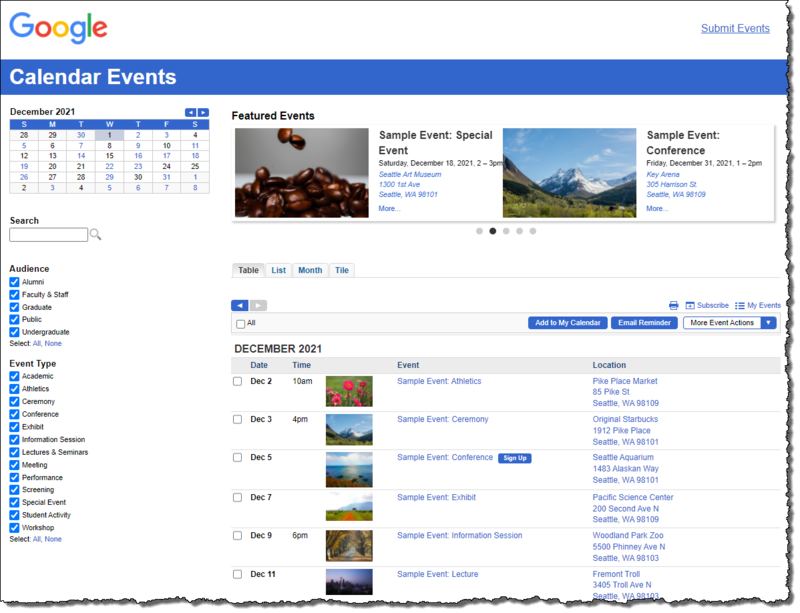 In Trumba, you organize events using calendars, custom fields, and event templates. In many cases, it's best to manage all of your events using one calendar, one event template, and a few custom fields, which is the model we follow in the Get Started articles. Tip Depending on your organization, you may need more than one calendar and/or event template. For information, go to: Implementation Guide - Templates, fields, and calendars. For the Get Started articles, we ran the wizard using the General Events calendar type, and then scanned Google.com for the default colors and styles. Your calendar will reflect the choices you make. It's important to have this context at hand when you begin to make adjustments to your calendar, and then add your own events, which is covered in Get Started 2 through 6. When you completed the wizard, your "hosted" calendar was published to the Web using the default views, controls, and settings generated by the wizard. All of these are configurable, but the Get Started series assumes you've started with the wizard defaults. While your hosted calendar is publicly available on the Web, its URL is in the Trumba domain, so it's primarily used only as a preview and test tool. In the screenshot above, for example, the URL for the site shown is: http://www.trumba.com/calendars/your-calendar-events. Standard practice is to embed the calendar views and controls, as you've configured them in Trumba, into your organization's website. The views and controls, known as "spuds," provide all the benefits of your active Trumba calendar, integrated into your own site. For more information, go to: Get Started 3: Spuds, publishing, and integrating calendars. Before you begin updating your calendar, we recommend reviewing the hosted calendar, generated by running the Trumba Startup Wizard. For help with setting up and/or modifying the fields, values, global color settings, and spuds in your default hosted calendar, go to Get Started 2 and Get Started 3. If you're not there already, go to the Trumba Connect home page. Click Sign in, and then enter your Trumba credentials. Open your live, hosted calendar by clicking the "Published at: calendars/<unique-web-name>" link above the editing environment. Your hosted calendar displays the current main Calendar view (or "spud"), along with its collection of other spuds, using the styles and settings currently configured in Trumba. Featured events appear, automatically advancing along a slider at the top of the hosted calendar. This effect is achieved using the Event Slider promotion spud, the Featured Event field on the event template, and the option set in Publish settings. For more information, go to Get Started 2: Update fields and settings, and create events and Get Started 3: Spuds, publishing, and integrating calendars. Click the large bullets under the slider to move to a different event (and to halt the auto advance to the next event). Hover over an active date to see events from that date in a small popup (highlighted in blue in the screenshot below). Click the title of an event in a popup to go to the event detail view (highlighted in blue in the screenshot below). Click an active date to change the main view to the month of the event. Note The color of the days-of-the-week bar and navigation buttons above the Date Finder match the active button color set in the wizard. The color of the active days matches the active link color set in the wizard. The small calendar appears by applying the Date Finder promotion spud. Type "Festival" in the Search field to filter the view to only those events that include the word "Festival." The search widget appears by applying the Search control spud. Select one or more of the Audience and Event Type filters to see the effect in your calendar. You'll notice a search info panel at the top of the calendar indicating the current filters you've applied. Toggle between the calendar views above the events: Table, List, and Month, and check out the different views available. These views appear by applying the View Chooser Tabbed control spud. Note There are other calendar views available that you can provide for your site visitors, and you can control which is the default. For more information, go to Get Started 3: Spuds, publishing, and integrating calendars. 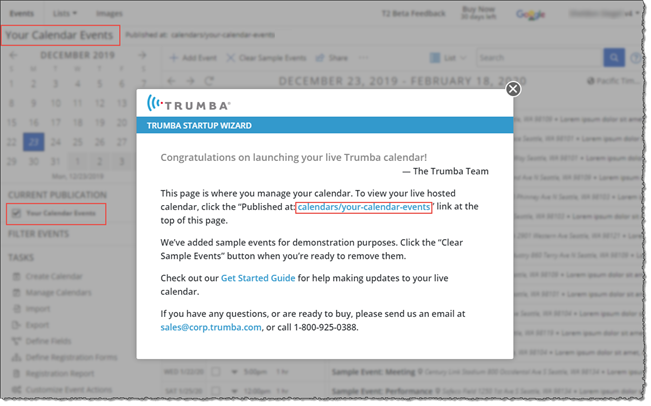 Sample events are generated by the wizard, and appear on your default hosted calendar to help show how Trumba can work with your real events in the future. 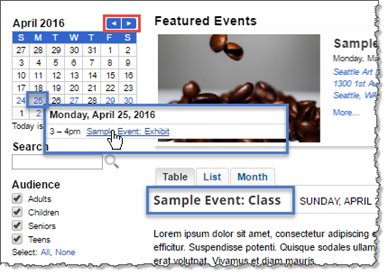 Click the title of a sample event in any of the views to open the event detail page. On the event detail page, explore the event information, field values set for that event (and applied by the filters in the hosted view), link and map to the location, and available event actions (see the next step). Visitors to your published Trumba calendars can take actions with the events. For example, they can add selected events to their personal calendars, set up event reminders, send event information to up to 50 friends, post events on Twitter and Facebook, and more. For more information, go to Get Started 5: Event and calendar actions. The wizard defaults include setting event registration on a few of the sample events (which allows site visitors to sign up to attend those events). Note: The sample events use a basic registration form. You can use this same form or create your own form with custom registration questions. For more information, go to Get Started 6: Event registration. Click one of the Sign Up buttons to open the Event Registration panel, and then review the information and registration features available for site visitors. The Trumba editing environment is where you manage your calendar and events. All of the views and controls that you reviewed on your hosted calendar in the "Try It" section above are configured here in the editing environment. This section assumes you're starting from the default settings generated when you completed the Trumba Startup Wizard. It's important to review the basic building blocks of the Trumba editing environment and the default settings generated by running the wizard, prior to making updates. For help and practice with making the updates, as required for your organization, go to Get Started 2 through 6. The Trumba editing environment opens with your new calendar displayed. Your calendar shows as active (and selected with a check mark) under Current Publication on the left (highlighted in the screenshot at the top of this page). IMPORTANT The calendar shown and all calendar-specific controls in the Trumba editing environment apply only to the currently active calendar. List is the default view in the Trumba editing environment. Take a look at the other views available at the top-left of the page: Day, 3 Day, Week, 5 Week, Month, and Year. Click the left and right navigation arrows to move to prior and future months (highlighted in red in the screenshot below). Click an active date to change the view to Day, which displays all the events scheduled for the selected day(highlighted in blue in the screenshot below). Sample events are generated by the wizard to demonstrate how you can work with real events in the future. Click the title of a sample event in any of the views to open the Edit <"event title"> page. Explore the tabs and fields available in the default event template generated by the wizard. For more information, go to Get Started 2: Update fields and settings, and create events and Get Started 6: Event registration. You can delete the sample events now or later, by clicking the Clear Sample Events button, but we recommend keeping them at least while reviewing the Get Started articles, so you can practice applying Trumba's key features. Under the Other Tasks section in the lower-left of the editing environment, you'll find the link to Define custom fields, which is where you modify the custom fields and default event template generated by the Trumba Startup Wizard. For more information, go to Get Started 2: Update fields and settings, and create events. Also under the Other Tasks section, is the link to Define registration forms, which is where you define the registration forms that are presented to site visitors for events with event registration set up. For more information, go to Get Started 6: Event registration. Note The Clear Sample Events button appears only until you've clicked it once, to remove your sample events. Click the Publish button to open the Publishing Control Panel. Explore the main calendar, control, and promotion spuds you saw in action on your hosted calendar. You configure, generate, and copy the spud code from Trumba, and then paste it into your own organization's overall website code. For more information, go to: Get Started 3: Spuds, publishing, and integrating calendars. Click the Help link at the top-right of the editing environment for easy access to the Get Started articles and other product documentation. Tip You can also click the Help widgets ( ) for in-context information and tips wherever they appear in the editing environment.